There has been a lot of talk lately about the benefits of Himalayan salt lamps. You’ve probably already seen one at your friend’s house or a while out shopping. They tend to be pinkish lamps, roughly egg-shaped with a dull, warm light at the center of it. But what do these lamps actually do for your health? What are the Himalayan salt lamp health benefits, if any? How does a Himalayan salt lamp work? In this article, we’re going to explore Himalayan salt lamps, from what they can do for your health to how to make a Himalayan salt lamp yourself. By the time we are done, you should know whether a Himalayan salt lamp is right for your home and even how to make it yourself. If you are reading this article, there’s a good chance that you’ve already heard a little about the multiple health benefits that come from using a Himalayan salt lamp. Depending on the web site and manufacturer of the lamp, these things sound like they can cure almost anything within a night or two of setting one up. But, the simple fact is that many of the claims about what these lamps can do are at the very least not scientifically backed, and at their worst, completely untrue. Broken down to its simplest parts, a Himalayan salt lamp is a chunk of pink Himalayan salt (usually mined in Khewra, Pakistan) that is hollowed out so that a lamp or heat lamp can be placed inside. The salt itself is hygroscopic, which means the salt will attract water molecules and water vapor. The lamp dries the salt, which releases the water vapor back into the air. The lamp itself tends to have a nice, soothing glow of a pink to orange hue depending on the mineral concentrations in the salt. This is all well and good of course, but what does this actually mean for your health? We’re glad you asked. So, you know the fundamentals of how the Himalayan salt lamp works, but you may be curious to know where the health benefits for you and your household kick in. At its core, a Himalayan salt lamp is a natural air purifier. As we previously discussed, the salt naturally draws water vapor to it. The lamp dehydrates the salt and releases the vapor back into the air. The water vapor that is initially floating in the air could be filled with air pollutants from the outside world. The Himalayan salt lamp brings in that impure vapor and traps the pollutants in the salt. Then, the lamp heats up and releases the water vapor back into the air, free of contamination. This purifying effect is great for people who struggle with breathing issues of varying degrees. From chest colds and coughs to allergies and asthma, the air purification from a Himalayan salt lamp may help you breathe more easily. The lamp itself can be very calming for the mind. Its warm, muted pink glow can often help ease your consciousness, allowing you to let go of stress and relax. The light of the lamp combined with the air purification may also help you get a good night’s sleep. 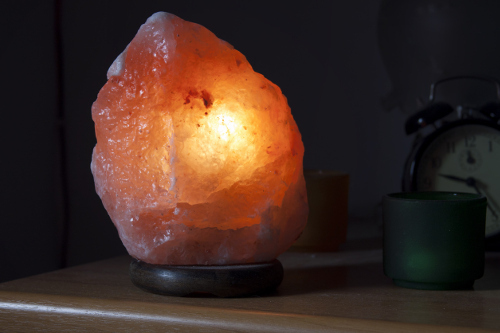 You may have read about the Himalayan salt lamp’s ability to generate negative ions and help clean the air around you of electromagnetic fields. Don’t worry; we’re coming to that. First, let’s tackle the big precaution and warning. As we previously mentioned, there are a lot of vendors that make grand proclamations about what a Himalayan salt lamp can do for your health. One of the biggest assertions is that a Himalayan salt lamp can help generate negative ions. These negative ions can help clean the air of bacteria, make you more alert, and reduce drowsiness, according to merchants. Furthermore, it could help reduce the possible effects of positive ions generated by the many electronic devices that have claimed our modern life. Unfortunately, it’s not true—or at least not to the extent that many manufacturers would have you believe. Himalayan salt lamps can create negative ions; that is correct. Negative ions can help balance out positive ions, decrease lethargy, and make you more attentive overall. However, a Himalayan salt lamp does not generate the number of negative ions that you would need to make these statements realistic. In terms of choosing a lamp, you should look for a rough salt appearance (it gives more surface area for the collection of water vapors), a darker colored salt that should be 100% Himalayan, and the bulb itself should be heat producing. While LED bulbs will save you energy, they will not provide the heat needed for the salt to do anything useful. Of course, you can always make your own. There are two DIY methods. You can secure a metal or glass container to hold your light source (and also conduct heat) and use chunks of Himalayan salt as opposed to one solid mass. Make sure you can get the power cord for the lamp out of the container. This method is good if you want your lamp to blend in with a particular decor. The other method is to use a lamp similar to the one above, but make sure it has a base that can hold a large piece of Himalayan salt. Take that large piece and hollow it out using tools suitable for the job (a drill press can do this quickly and easily). Be warned—make sure to clean your tools afterward so the salt doesn’t lead to rust and dulling. Should I Get a Himalayan Salt Lamp? Now that you know the ins and outs of Himalayan salt lamps, you may be wondering if it’s anything you should bother with. Despite the claims of negative ion creation being somewhat exaggerated, a good Himalayan salt lamp might help purify the air in a room. And if you have any sort of breathing problems, this is a good and fairly inexpensive way to help you with your problem. “11 Himalayan Pink Rock Salt Lamp Health Benefits,” Critical Cactus, October 3, 2015, http://www.criticalcactus.com/himalayan-pink-salt-lamp-health-benefits/, last accessed June 7, 2017. Ferguson, J.,How to Make Your Own Himalayan Salt Lamp,” Inspire Me Naturally, December 30, 2015, http://www.inspiremenaturally.com.au/make-himalayan-salt-lamp/, last accessed June 7, 2017.